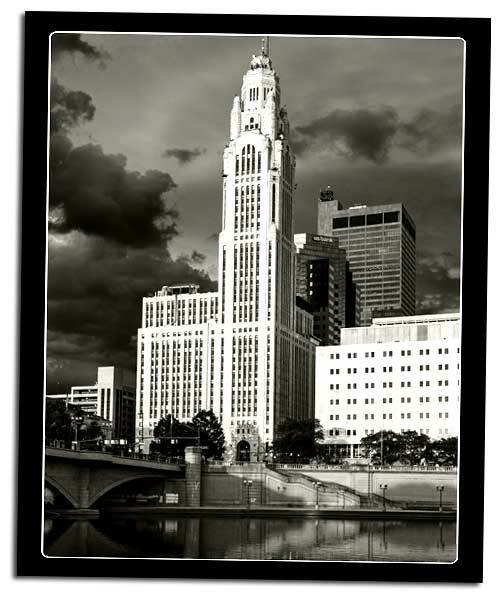 The LeVeque Tower at 50 West Broad Street has long been the defining image of Columbus' skyline.Originally constructed by the American Insurance Union, the building became known as the AIU Citadel or sometimes just the Citadel. 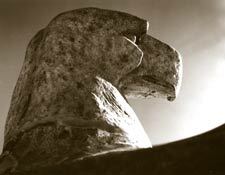 The building is festooned with eagles, arcane symbols and figures of people from ancient mythology and the ritual of the organization. The terra-cotta eagles guarding the main entrances have wing spans of 25'. Originally there was a statuary group 495' above the street on all sides of the tower, a 26' tall man embracing two children. 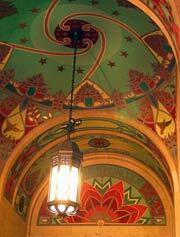 The exterior ornamentation was executed by Chicagoan Fritz Albert after designs by New York sculptor Carl H. Keck. A bronze plaque with the horoscope of the tower and the positions of the planets at the time of the laying of the cornerstone (February 12, 1925) is set in the lobby floor. Today, if you look closely just below the micro-wave dishes near the top, you can see the giant stone eagles with outstretched wings. Behind these wings is a narrow walkway that goes around the outside of the top. 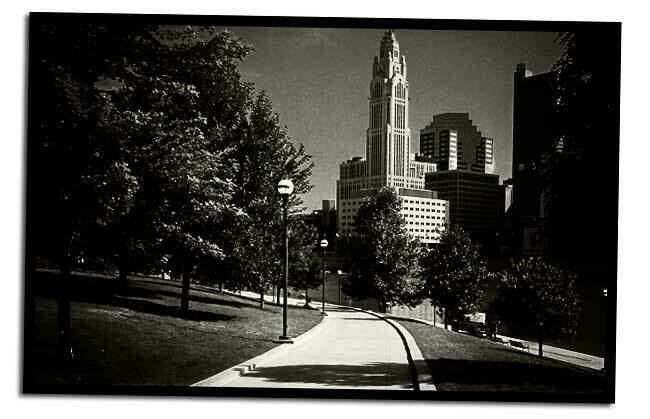 The Leveque Tower was just part of a larger project to cleanup and develop the Scioto River area. Prior to this the Scioto River flooded frequently, in fact, the 1913 flood destroyed the Broad Street Bridge and much of Franklinton which lies on the west side of the river. Along with the new tower, the city also built City Hall, widened the river, and built a concrete retaining wall on both sides. 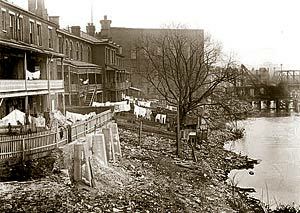 Prior to this, the river was lined with slums that went right down almost to the water's edge. When the Great Depression came, it caught the AIU short of funds. Money that should have been used to keep the company liquid, were needed to pay for the structure when building costs ran over, due to unforeseen difficulties. Within a few years the American Insurance Union failed and the future of the building was uncertain. By 1935 the American Insurance Union having been forced into bankruptcy, sold the building to a group led by Leslie LeVeque of Columbus and John Lincoln of Cleveland (founder of Lincoln Electric). 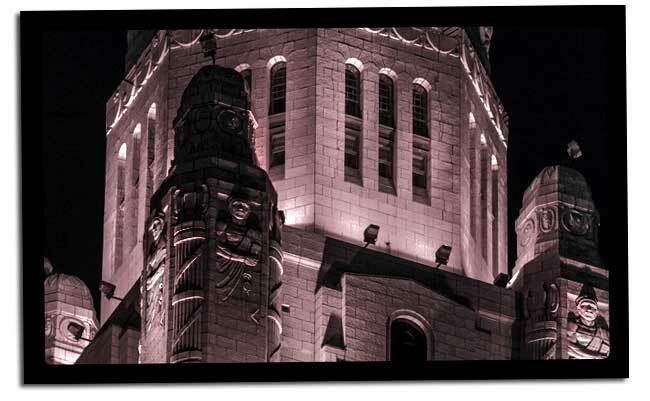 At that time the building became known as the Lincoln-LeVeque Tower. The building was added to the National Register of Historic Places in 1975. In 1977, the name was officially changed to the LeVeque Tower. The building later changed hands to Lennar Properties in 2004, and then again to the new owners Finsilver/Friedman Management, a Michigan based regional developer and property manager. At different times of the year, the exterior lights on the tower will be changed to reflect different occasions. Red and green for Christmas, pink for Breast Cancer Awareness Month, all green for St. Patrick's day and of course red, white and blue for July 4th. The rest of the time it is illuminated with just white light. The colors have to be changed manually by placing gels over the lamps. For many years the tower was not lit, but thanks to the efforts of Doug Adair, a local Channel 4 anchorman, he successfully (after a few tries) managed to get the building lit through the cooperation and support of many people and it has been lit just about every night since. Broad and Front Street in the 1920s before the American Insurance Union (AIU) built their tower. The large 3 story building in the center is the American Insurance Union office. To the right of them is the Colonial Theatre. 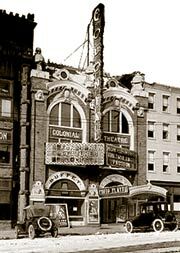 The Colonial Theatre opened in 1909 and was torn down when the AIU built the tower in 1924. On the marquee is an advertisement for the movie "The Ruling Passion" released in 1922. Part of the new tower featured the Palace Theatre.